When the six Steel Electric ferries were built in 1927 in San Francisco, Ford was still making Model Ts. The name refers to their steel hulls and diesel-electric propulsion systems. The ferries’ names (with their original names in parenthesis) were Enetai (Santa Rosa), Illahee (Lake Tahoe), Klickitat (Stockton), Nisqually (Mendocino), Quinault (Redwood Empire), and Willapa (Fresno). After the San Francisco-Oakland Bay Bridge opened in 1936 and the Golden Gate Bridge opened in 1937, the ferries, operated by the Southern Pacific Golden Gate Ferry Company, were no longer as profitable. 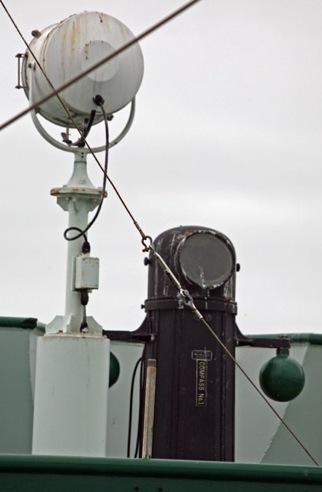 The Black Ball Line in Washington bought all six Steel Electric ferries for $330,001 in 1940. A Brazilian company had bid $330,000. 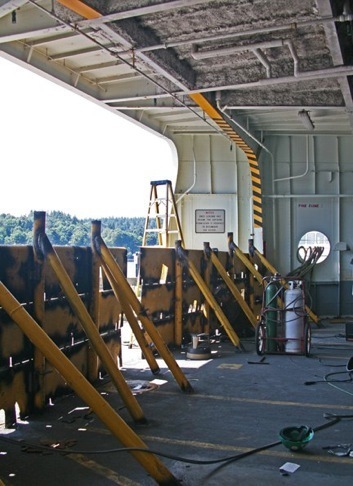 In 1951, Washington State Ferries began operation, buying out Black Ball’s ferries, including the six Steel Electrics. In 1967, Steel Electrics Willapa and Enetai were retired after 40 years of service. 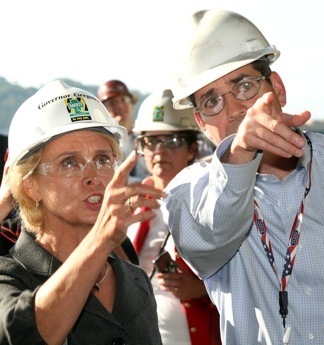 They had served the Seattle-Bremerton route. The other four Steel Electrics would remain in service another 40 years. The Klick and the Q-Boat, as they’re sometimes called, served on the Port Townsend-Keystone run. Illahee served the San Juan Islands, and Nisqually was the back-up boat. 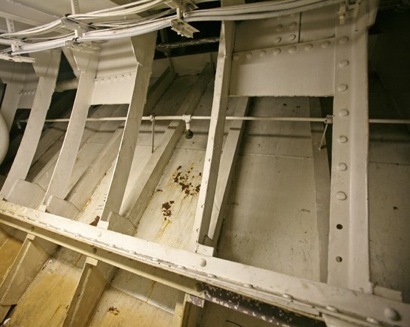 Between 1982 and 1987, the remaining Steel Electrics were stripped down to bare hulls and rebuilt. The brass and oak interior trim was added in that process. 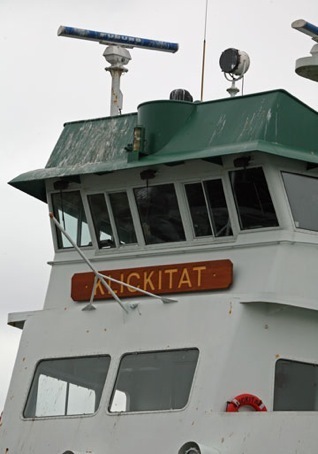 Klickitat was the first to be rebuilt, and it received a larger pilothouse and, unfortunately, passengers could not walk around the stern or bow on the exterior; the other three did not have this design flaw, and they also got elevators. 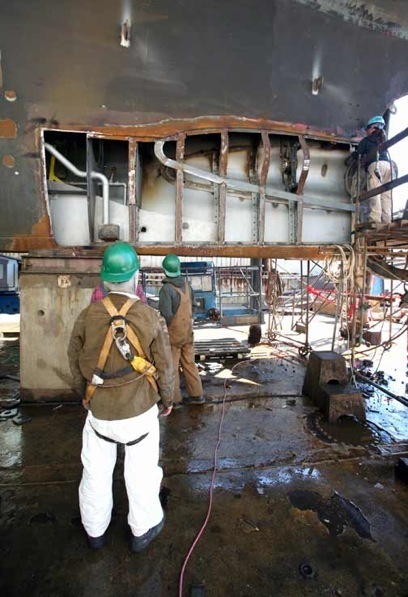 In April 2007, Klickitat developed a crack in her hull that caused some weeping. The problem was quickly fixed, but it was the beginning of the end. That summer, WSF replaced “stern tubes” where the propeller shaft is inserted on Quinault and Illahee at a cost of several million dollars. 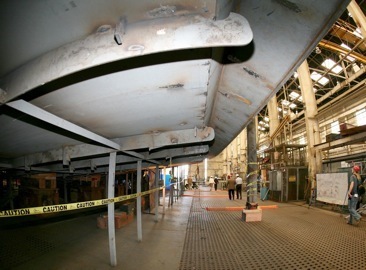 While that work was being done, a hull inspection led to concerns about rust, and more inspections. 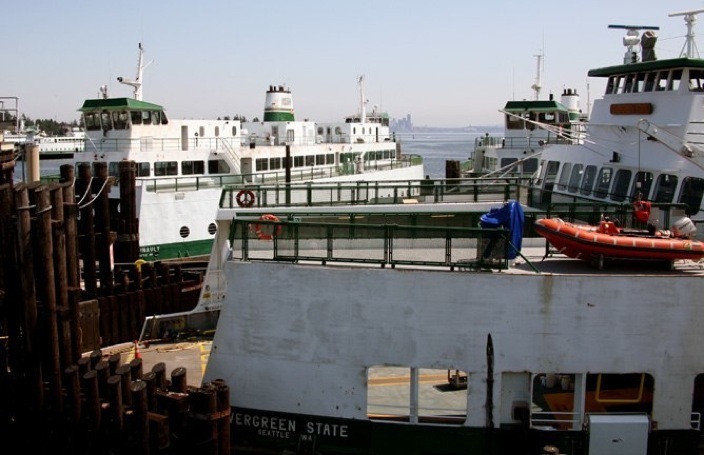 Two days before Thanksgiving, all four were abruptly retired, leaving the Port Townsend-Keystone route without vehicle service until Pierce County kindly leased its Steilacoom II to WSF, which continues in service until the first Island Home-based ferry is delivered in the summer of 2010. Meanwhile, attempts to sell the four Steel Electrics foundered via the state’s surplus property system. Then they were listed on eBay with a minimum bid of $350,000 and received no bids. 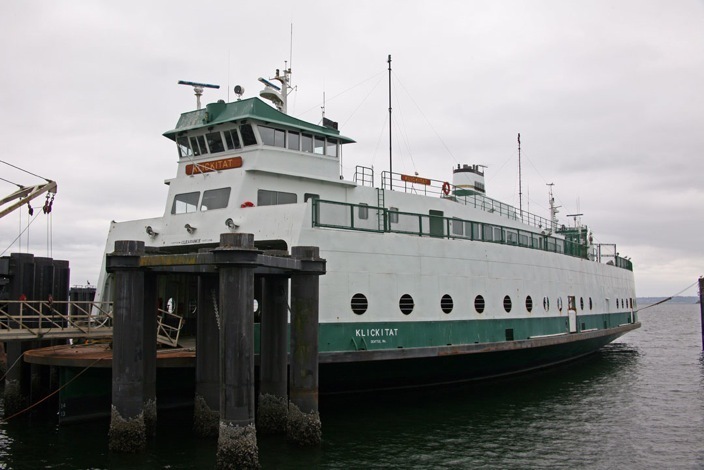 The City of Port Townsend expressed interest in acquiring one ferry for a purpose to be determined, and a scuba diving group proposed that one be sunk to create a diving park. Those ideas and tentative sales to a ship scrapper and then a real estate developer fell through. But in June 2009, Eco Planet Recycling of Chula Vista, Calif. bought all four for $200,000. Given that Black Ball bought them for $55,000 apiece in 1940, you might say they held their value pretty well. The ferries were tandem-towed from WSF’s Eagle Harbor facility to Industria Naval Del Pacifico in Guaymas, Sonora, Mexico for scrapping. 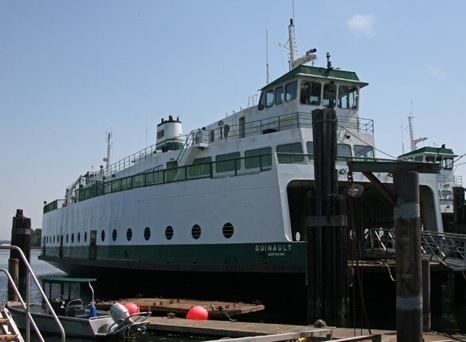 Quinault and Nisqually were towed away on Friday, Aug. 7, Klickitat and Illahee on Friday, Aug. 14. 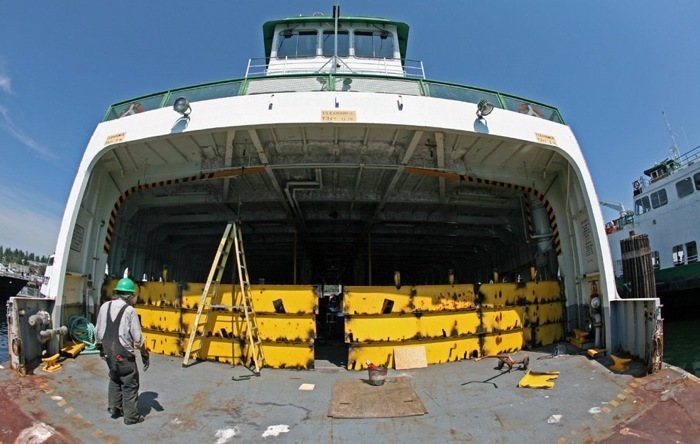 According to WSF, it only took three weeks to completely scrap each ferry. Various components such as engines and electrical equipment were removed and the rest of the vessels cut up. Although the best-known Steel Electrics may be reincarnated as Toyotas, Enetai and Willapa are still intact, although they are no longer operable vessels. 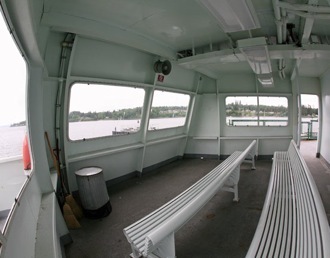 Meanwhile, Rhododendron is now the oldest ferry in the WSF fleet, built in 1947. 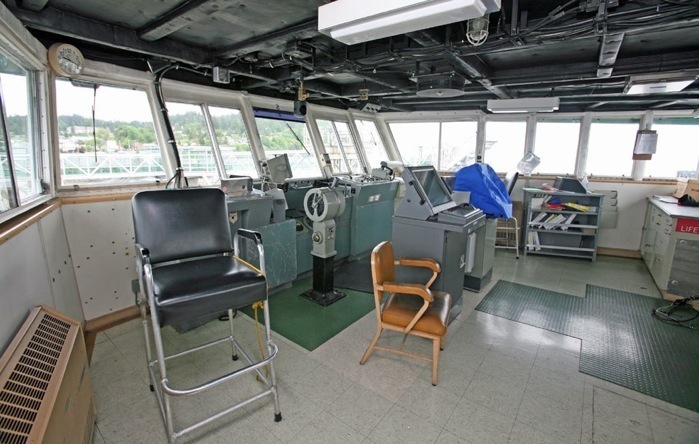 Below her pilothouses, Klickitat had these open-air seating areas. In her passenger cabin, Klickitat did not have the fancy glass and oak woodwork given to Quinault, Nisqually and Illahee. And The Klick was the only of these four Steel Electrics that lacked an elevator. 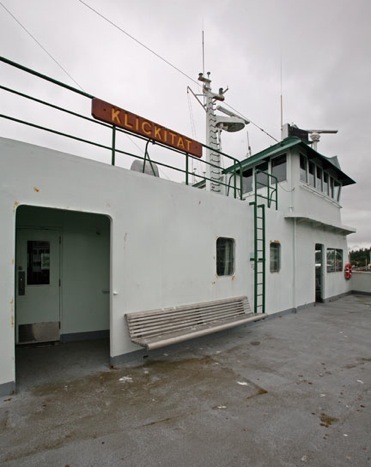 Perhaps the best-loved Steel Electric ferry was Klickitat, built with five others in her class in San Francisco in 1927 – when Ford was still making Model Ts. 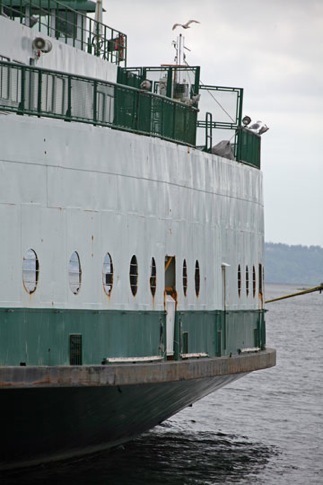 After her abrupt retirement in 2007 due to concerns about rust, Klickitat was moored at Washington State Ferries’ Kingston terminal (above) prior to being towed to Mexico for scrapping on Aug. 14, 2009. She and Quinault served the Port Townsend-Keystone route. 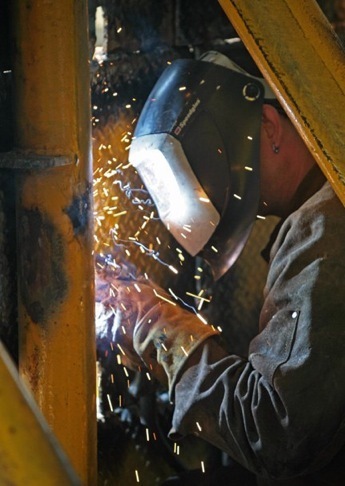 On July 31, 2009, WSF boilermakers cut up the metal curbing from the car deck of Nisqually and welded it together for a breakwater at the bow for the long ocean tow to a scrapyard in Mexico. Above, Klickitat languishes at the Kingston ferry terminal in 2008. In this July 31, 2009 view of WSF’s Eagle Harbor maintenance facility taken from the deck of Nisqually, you can see (from far left) Klickitat, Quinault, Illahee and Evergreen State. 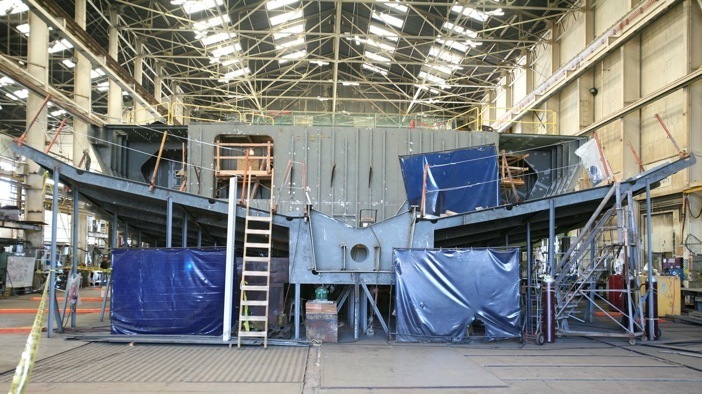 The latter was getting repainted while the Steel Electrics were prepared for scrapping. 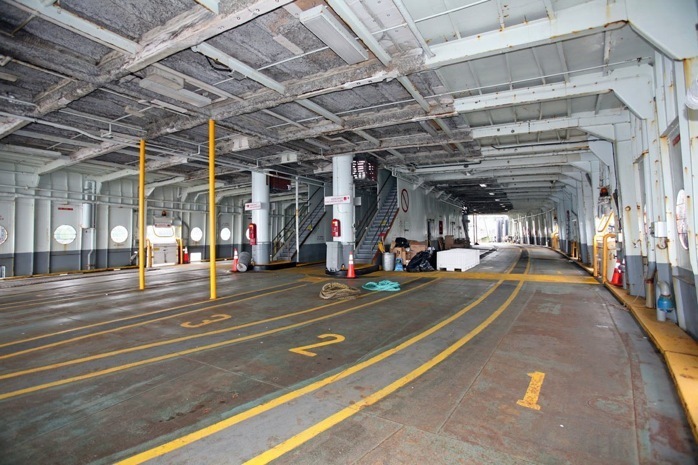 Compared to the temporary replacement ferry Steilacoom II, Klickitat’s car deck seems huge. 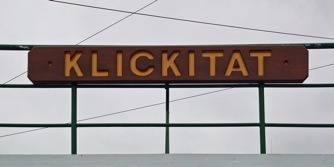 Klickitat held 64 cars, but the other Steel Electrics held just 59 and Steilacoom II, 50. You’ll sometimes see different numbers quoted, but these are the official capacities according to Washington State Ferries. 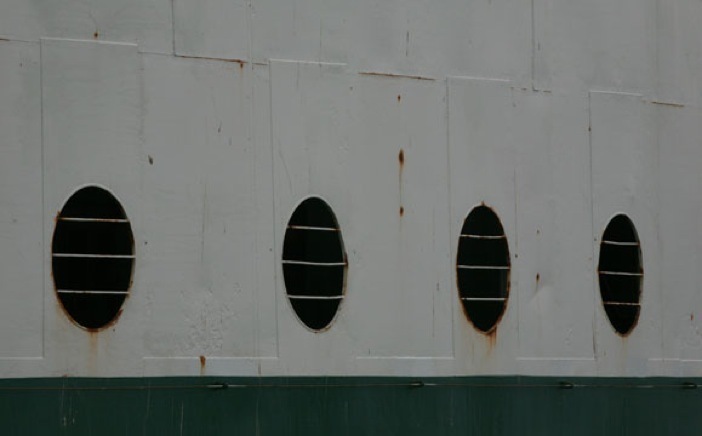 The Steel Electric ferries originally had square, double-hung glass windows (see pattern of welded panels) which were replaced with round, open-air portholes after they were placed in service in Washington. 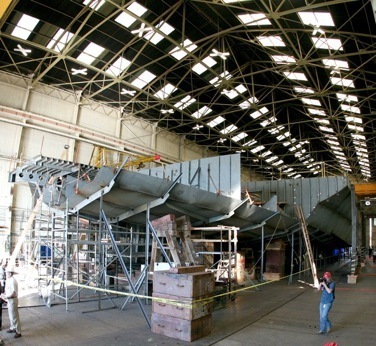 At upper left, Quinault receives two new stern tubes (one at each end, for the propeller shafts) at Todd Pacific Shipyards in August 2007. 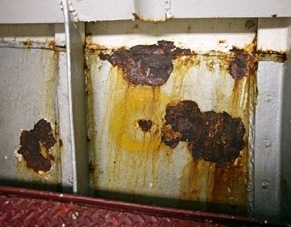 A few months and several million dollars later, all four Steel Electrics were retired due to concerns about hull corrosion. 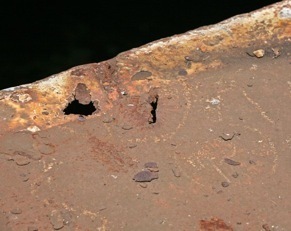 Clockwise from upper right: rust holes at edge of Nisqually’s car deck (2009), Klickitat’s hull, showing some original rivets (2008), rust below the waterline in Nisqually’s engine room (2009) and Nisqually’s original hull ribs with “sponsoned out” wider hull beyond (2009). Todd Shipyards photo is copyright The Leader; all others are BurkeDigitalPix. At left is Quinault at Eagle Harbor in July 2009. 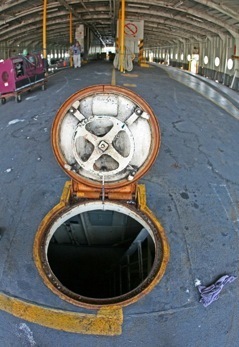 At right is a hatch on the car deck of Nisqually. 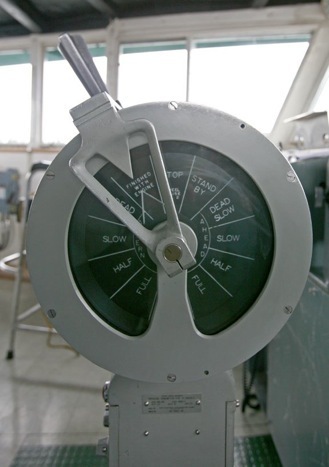 Above, Klickitat has a spacious pilothouse at each end. 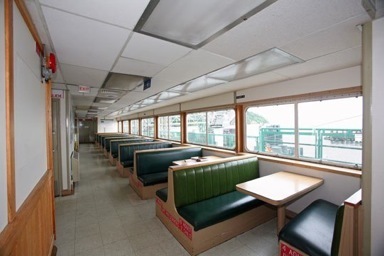 Nisqually (shown here) and the three other Steel Electrics refurbished in the 1980s had cramped pilothouses, but the tighter design left room for passengers to roam around the ferries’ exteriors. Klickitat’s telegraph was set to “finished with engine” in this 2008 photo. 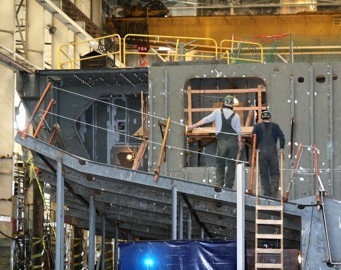 Here’s the new 64-car ferry Chetzemoka under construction at Todd Pacific Shipyards in Seattle on Sept. 24, 2009. The design is based on Island Home, which serves Martha’s Vineyard, Mass. That’s Gov. Chris Gregoire taking a tour with Steve Welch, CEO of Todd. When it’s completed, Chetzemoka will be about 80 feet longer than the components shown here, which have been assembled at four different locations. 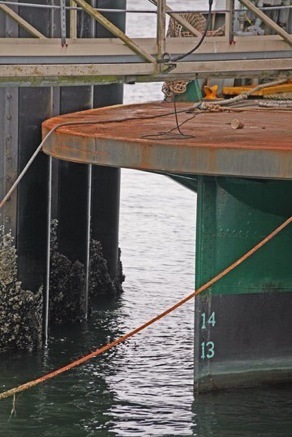 She’s scheduled to go into service on the Port Townsend-Keystone route in the summer of 2010.